The answer surprised me. It’s a combination of both innate psychology and pop-cultural evolution. The effect is that these simple and fun little drawings can actually be incredibly powerful tools for marketing your business. I get why you might be cynical. “Unprofessional”, you say, “Childish”. But hey, you’ll be surprised. Back to a decade ago, emoticons had humble beginnings started in online chat rooms. This is how most Europeans and East Asian use emoji last time, which is also known as emoticon. Social media and visual communication have since transformed these glyphs into colorful and surprisingly complex images. While in Facebook chat, even small animations. I’m sure you have seen the Facebook’s new emoji reactions to posts. That should tell you something about their commonplace acceptance in broader communication. According to Search Engine Journal, a huge amount of 6 billion emojis are sent every day, so there’s no way that you could ignore them. With almost as many emojis per day as there are people on the planet, even I have started to understand why they get their own appreciation day. I, myself hated emoji in the first place. I was the one who felt emoji is really unprofessional and it shouldn’t be used in business. However, as a marketer, I had to change my opinion. So should you. Audiences want quality products and services that they can trust. And the emoji trend came about because written words, without a LOT of work, simply can’t express everything compared to a live conversation can. Specifically, there are psychological, contextual, and social cues missing. So how do you ensure that your customers are able to trust you? To earn the trust of our audiences, our marketing has to be able to solve all the unnecessary anxiety, misunderstanding, and conflicts that they’re having. That is why emoji is here today. Emoji helps people to re-establish some of the cues that are missing in text, as well as making the text feel friendlier and more informal. To you and I, that essentially means finding ways to seem more human over instant messaging. It doesn’t matter how hard you try because without those important contextual cues like intonation and facial expression, the readers can basically make their decisions based on imagination. This also means that it might cause misunderstandings, arguments, and for you, losing the customers. Let’s just think of it this way: When was the last time you read a film script instead of watching the film? Never, right? Right. People use emoji to fill out their bare text with colorful accents, use them for emphasis, and crucially to convey emotion and tone. But what about business? When you put yourself on the same level as your customer, you’re creating a personal connection and making yourself seem open and accessible to them. Amazingly, the majority who have embraced emoji is overwhelming: 92% of online users have used emoji at least several times a year. 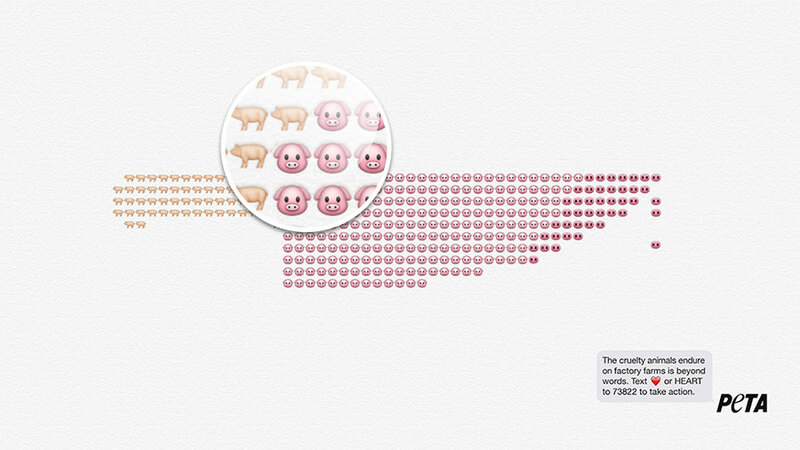 Now, can you see how powerful the effect of emoji is? 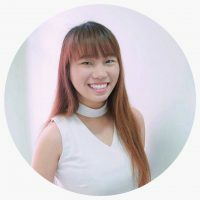 Emogi is a company that specializes in emoji driven marketing, and describes its mission as ‘sentiment driven solutions’. 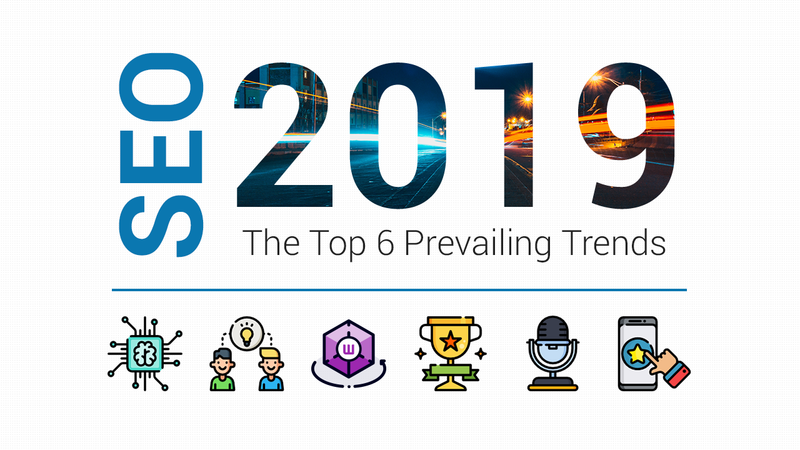 As the Internet evolve, it is getting difficult to draw conclusions from the often conflicting sets of data and the lack of any immediate and easy fact-checking means that people have given up on ‘facts’ and prefer sentiment. Sentiment feels good because it reinforces our pre-existing beliefs instead of challenging them. The ‘Awwwww!’ reaction to cuteness is hard-wired into us by evolution. This video will give you a clear understanding of what makes things cute – small, round, soft-edged. These are the exact principles applied in most emojis. They are designed to trigger our cuteness response, which automatically makes us more susceptible to their sentiment. As such, they can be a powerful tool in marketing, especially in the current culture. Other Brands Have Already Been Nailing It, Why Not You? Emoji marketing is still being pioneered, but some brands have already made a killing from it. If you don’t get on board soon, you risk being left behind. I’ve hunted down some of the best successes so we can look at the key insights. We’ll start with one of the best and most recent examples. 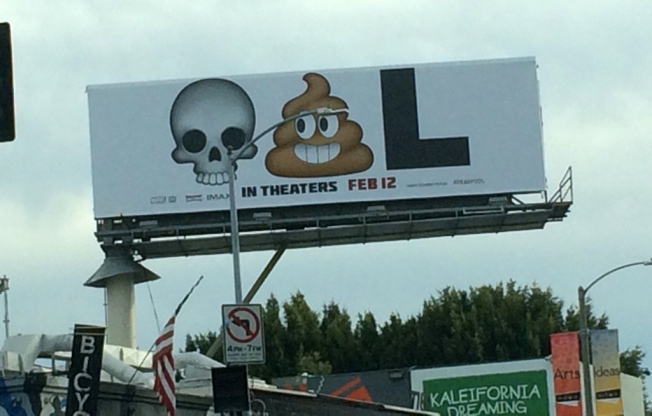 Deadpool’s emoji marketing campaign is the biggest success in recent history. That’s because it’s awesome. AdWeek called it “so stupid it’s genius”. Apparently, the ad helped Deadpool break all the box office records for an R-rated movie, making as much as $745 million figure. Why It Rocks: Deadpool’s marketing had already been working hard to establish an irreverent, disruptive tone. It wasn’t like any other movie out there, which is how the movie took things to another level. The emoji worked for a few reasons. First, they changed the context of emoji use. Had they not been printed, on paper, on a physical billboard out in the real world, the idea would quickly have been forgotten about. The intrusion of digital life into the physical world immediately made it stand out. Totally respecting the power of surprise. Secondly, the ‘smiling poop’ emoji is the center stage. It’s one of the most popular emoji out there (with a fascinating history), and people already think of it as funny, mischievous, and naughty. All of the values align perfectly with Deadpool’s established tone. Domino’s emoji marketing campaign delivered in a very different way. Literally. They made it possible for us to order pizza with an emoji. How cool is that? We only need to set up a Domino’s account and a favorite order, then link our Twitter to the account. From there, when we tweet Domino’s with the pizza emoji, our favorite order will be delivered to the door. Why It Rocks: This made Domino’s the first company to enable emoji ordering. It’s a gimmick, but a fun one. It made it as easy as humanly possible to get pizza delivered. It was the natural high point in convenience ordering. 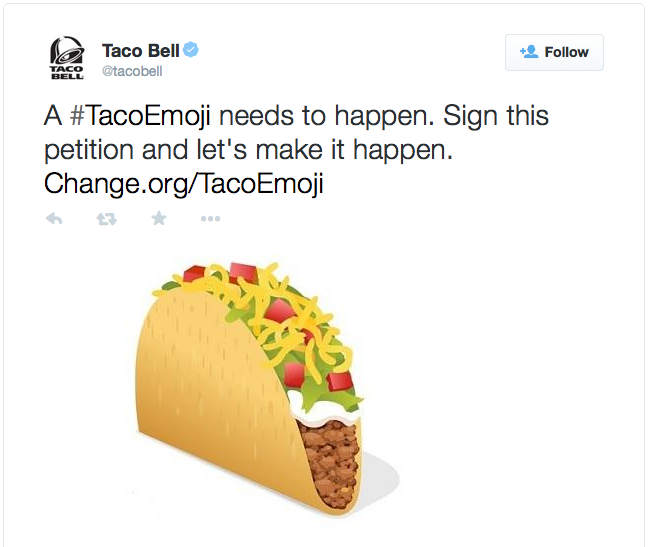 Taco Bell soon followed suit by insisting on an emoji marketing campaign to create a taco emoji. This was a different kind of campaign, enlisting existing passionate users to support a petition, which was then successful. Why It Rocks: This was a case of helping customers express their love of tacos, publicly and in full view of their social networks (because other than pizza and hamburgers, we love tacos too!). It was a viral success, reminding many that they loved tacos and inspiring many more to give them a try. An interesting notion from the language Taco Bell used was also one of legitimacy. They addressed the issue on why do pizza and hamburger lovers get an emoji but taco lovers don’t? This helped to create a sense of tribalism. They cultivated the sentiment and attached it to an identity of “I’m a Taco Lover!”. 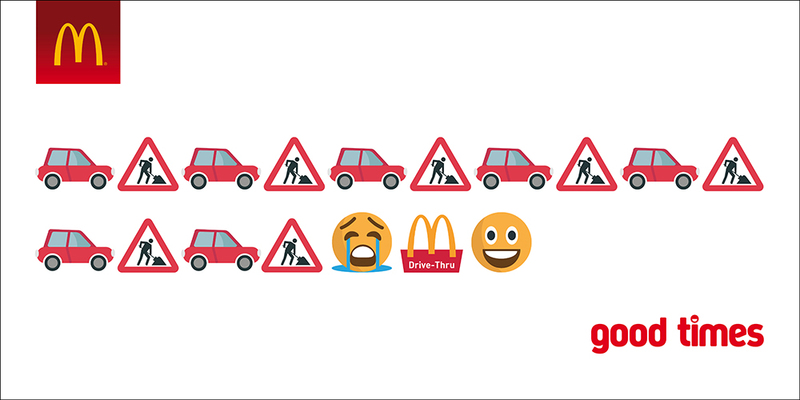 Causes have managed to use emoji to great effect. They tapped into the roots of emoji as iconography, and again made powerful use of the principles of sentiment, cuteness, and tribalism to deliver measurable results. He For She is a campaign started by the Harry Potter actress, Emma Watson, designed to enlist men to become feminists and fight for gender equality. The campaign was created to overcome the sense that feminism was in any way ‘anti-men’, and instead, ask men to be ‘pro-women’. The emoji is a logo, combining the ‘cross’ and ‘point’ of the male ♂ and female ♀ symbols. As a result of Watson’s backing and the custom emoji, #HeForShe mentions increased by 115%. Why It Rocks: This was a success in large part because of the design and the message it carried. Symbols have always been powerful when combined with a cause. This was not cute and complex – it was clear, straightforward, and simple. It even has its own unique shade of magenta to balance the traditional notions of feminine pink and masculine red. 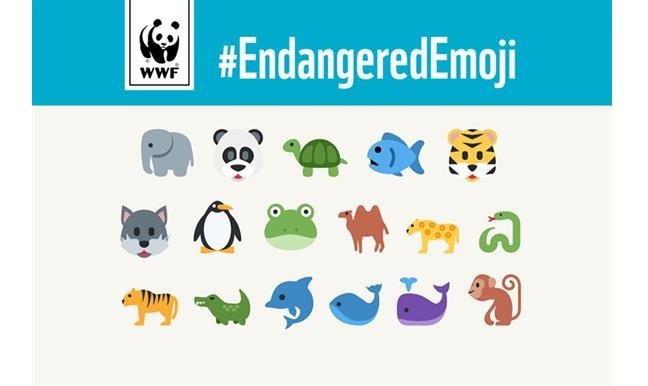 WWF created 17 emojis of animals that were endangered species. The idea was for individuals to sign up to the WWF and donate 10 cents every time they tweeted one of the emojis. Why it Rocks: This use of microtransactions and linked accounts helped people to express themselves with fun, cute images while also supporting a good cause. As you can see, there are many products and services that can be represented through existing emoji, and the aligning of these characters with a sense of cause, identity, and sentiment are what won through here. Using emoji is not used as an end in themselves but as a medium, McDonald‘s commissioned artwork created using only emojis. The art depicted happy meals, desserts, and burgers using music notes, thumbs up, hearts, and more. The images, therefore, had McDonald‘s food made solely out of positive things, aiming very deliberately to associate positive sentiment with the brand in keeping with their previous work (“I’m Lovin’ It”). Not only that, they also used emojis to create simple narrative comics in tweets, which create a simple premise then flipped it to deliver a joke-line punchline. 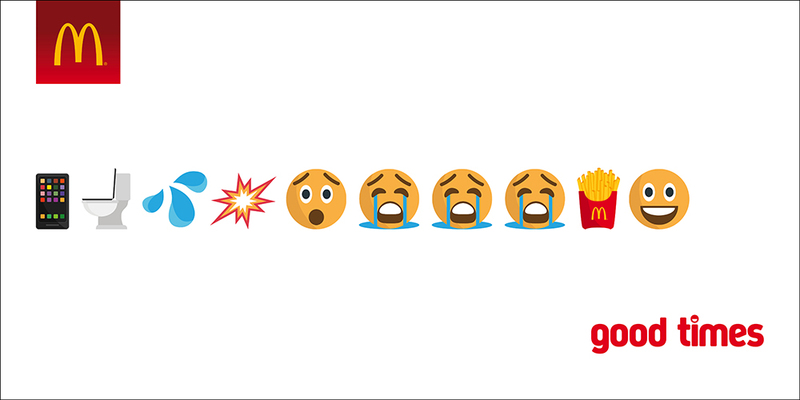 Let’s take a look at some of the ‘good times’ campaign from McDonald’s. 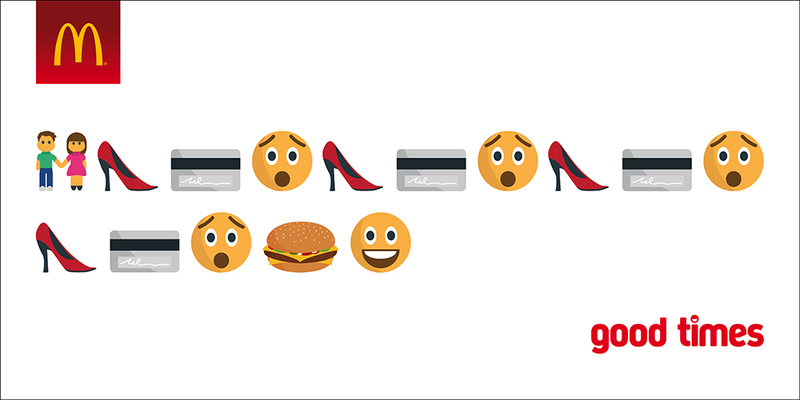 Why It Rocks: This is emoji marketing is at its simplest, yet most elegant. The campaign has helped to re-establish McDonald’s as part of the pop-cultural conversation. The blatant way in which positive emojis was used in the poster campaigns shows the idea doesn’t need to be complicated in order to be effective. 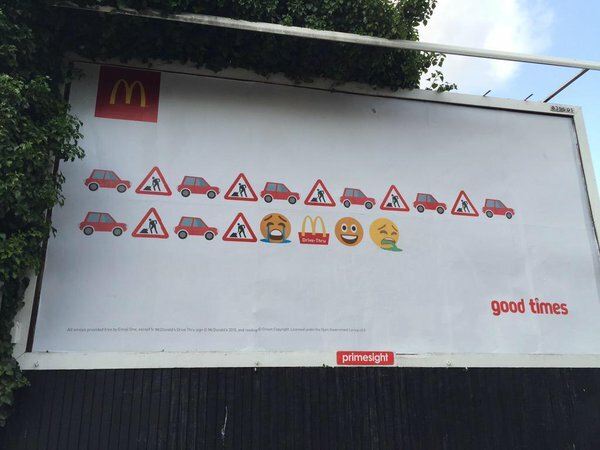 British graffiti artist pranks McDonald’s emoji billboard, probably leaving too much white space isn’t a great idea after all? Nonetheless, all coverage is good coverage. Meanwhile, Budweiser managed to use emoji in their original context to superb effect on July 4th with a tweet that went hyper-viral. They used simple, pre-established emojis but in a unique way. Using fireworks for the stars, USA flags for the red stripes and beer (Bud Light, I’m sure) for the white stripes, they created a replica US flag from emojis, that was retweeted for over 120,000 times. Why It Rocks: Budweiser managed to simultaneously stir patriotism on the most patriotic day of the year, while seamlessly slipping their product into the fabric of that patriotism. The artwork essentially says America on July 4th can be summed up three things: fireworks, the flag, and Bud Light. They rewarded preconceived ideas and be effectively co-opted them, channeling the passion towards their brand. Love them or loathe them, few brands incite passion like PETA. They’re one of the best at stirring emotions, or sentiment, and immediately saw the power inherent in emojis to simplify their message. Their marketing was accompanied by similarly powerful emoji billboards using composite elements to generate new, powerful iconography with a message. They created the campaign “beyond words” to create an ad that had a powerful message created through elegantly simplistic storytelling. Unlike McDonald’s, this use of storytelling packs a punch instead of a punchline. The advert uses emojis to show fashion items like shoes and lipstick and dresses, before ‘revealing’ the processes that go into them including slaughter, animal testing, and the death of the animals involved. Why It Rocks: PETA preaches largely to the converted, but created a powerful call-to-action (CTA) that was centered around conversation. They use marketing to challenge pre-conceived ideas of what is acceptable, inverting the usual process, and this creates an explosion of energy around the brand. All of the examples here have some extent of intent on generating discussion and raising awareness, but few have done it as powerfully as this. The emoji trend is here and it is here to stay. Emoji transcend language barriers, while increasing the richness of online communication. Using emoji marketing can be as simple as emphasizing your existing word choice, just like how Slack uses a flower to evoke the emotions around the word ‘Nurture’. Other than that, it can also be complex as a fully backed campaign across multiple touch points. Storytelling – the oldest and best marketing tool still holds up when used with new media. Tribalism – creating strong associations to pre-established beliefs can build your audience. Passion – Not all publicity is good publicity, but creating a conversation is free marketing you don’t have to generate yourself. What are your thoughts about emoji marketing? Do you think it’s worth a try? Leave a comment down below and let us know why you love/hate them.